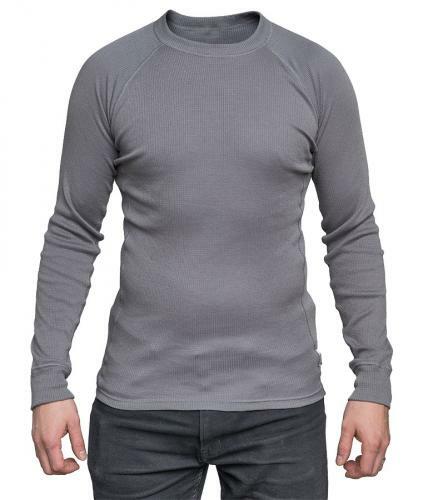 The Dutch army long sleeve shirt is something we would like to see more as surplus; a well made, lightweight and moisture wicking round neck top for cheap, just the thing you want to carry around just in case no matter what the situation is. A simple no-nonsense package: long hem, long sleeves, non-chafing seams and standard crew neck. Packs very small, won't take much space in your pack. Made of 100 % polyester, which means this transfers moisture away from the skin and dries quickly - crucial features in demanding use. Wash at 40 degrees Celsius. 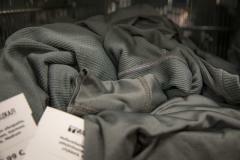 The texture of the fabric varies slightly, but they serve the same purpose. The one in the pictures is the more textured variation. The other is just smoother. Sizes in US-style easy system. 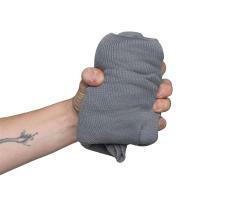 Just pick by your usual T-shirt size, these do stretch quite a bit. As said, the hem and sleeves run long - our model is regular height EU size 48 (US 38) and wears Medium. Note the sleeves which would fit for a way taller person too. Used, but washed and clean. You get a lot of shirt for the price. The availability seems to be rather poor, we try to keep these in stock to the best of our ability. Loistava kampe hintaansa nähden, miellyttävä päällä, ei hirmu karmeen näkönenkään. Loistava urheiluvaate, ei ihan niin loistava oleiluvaate ja syynä on tiukahko sovite, vaikka laihemman puoleinen olenkin. Tästä syystä itse käytän vain alimpana kerroksena. Pituus sopii hienosti pitkäselkäiselle. Suosittelen hintansa puolesta. 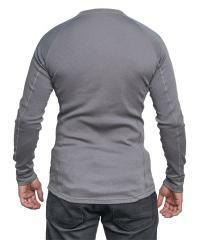 Great long sleeve functional undershirt. Unlike it's short sleeved brother this could also be worn directly under body armour because of a nice tight and a bit higher cut neck. Excellent shirt. Very pleased with this Dutch longsleeve undershirt so far! Shows signs of minimal use, but for all intensive purposes, this is in almost unissued condition. Only identifying tag on the inside of the torso reads "Ministerie van Defensie" (Ministry of Defense). As part of my first order, it arrived in Western Canada in only 1 week! This shirt will be perfect for those colder days, for layering when hunting, going to the shooting range, skiing, playing hockey, skating, etc. For 12.99 CAD, this is a great deal for an extremely useful undershirt. Thank you Varusteleka!